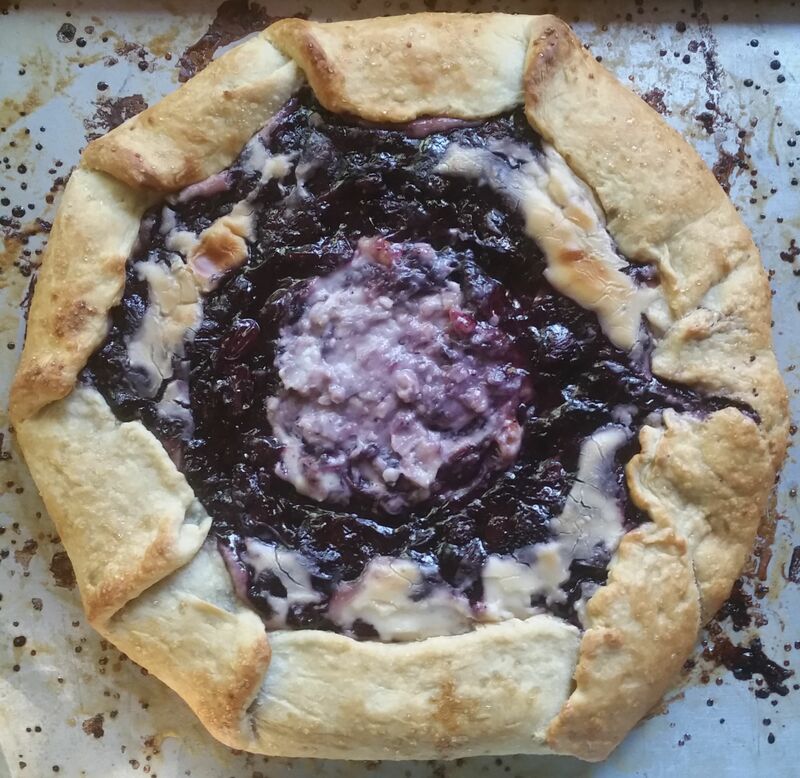 Blueberry cheesecake galette! 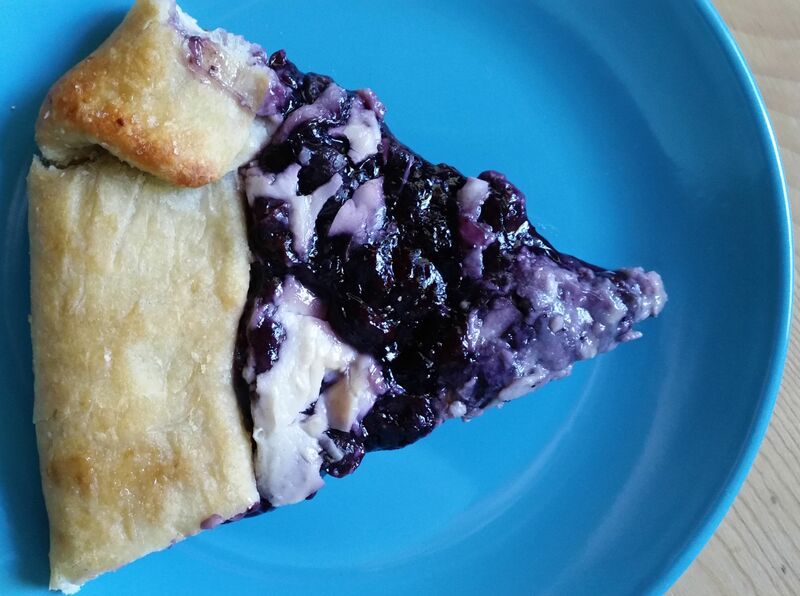 I know, we all know that blueberries aren’t really blue once you cook them. But I couldn’t resist this recipe. 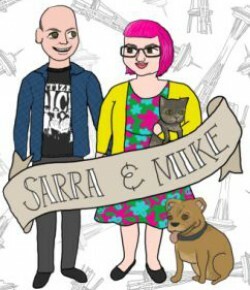 Mike gave me that wonderful rolling pin for Christmas last year. Though I’ve long admired the beauty, simplicity, and rustic form of galettes, I had never made one. I’m not sure why; I just always went for the pie if I was baking something like that. It was well past time for me to try my hand at one – and I’m so happy I did! It was easy, as these things go, and it turned out beautifully – a pleasure to look at, and absolutely delicious. 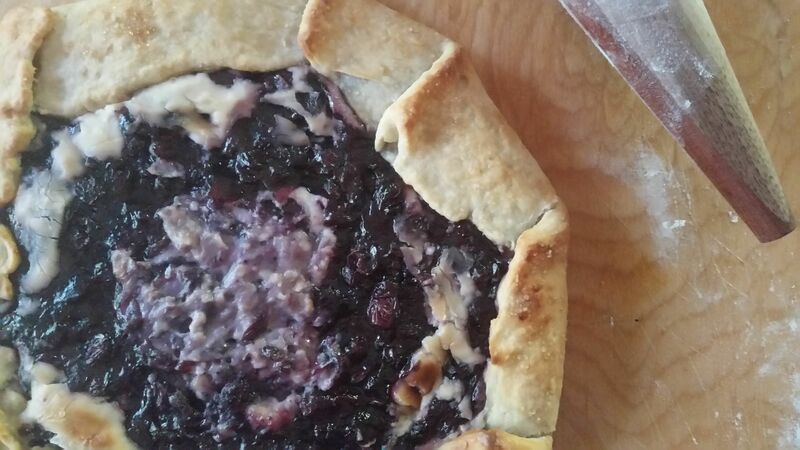 I mean, just look at those berries, and that sugar-sparkled crust! Last night, we had our slices with a little bit of Almond Dream’s Praline Crunch ice cream – Mike’s choice, and a most excellent one. This morning, though, I wanted to take advantage of the sunlight and take a few more photographs, so I had to cut a slice. And once I’d cut a slice, well, it would have been a shame to not eat it. If this sounds like I’m justifying having what amounts to pie for breakfast, you’re not wrong. But it is made of fruit, and cream cheese, and butter, and flour – and these are all breakfast ingredients! It’s like an arrow, pointing the way to happiness. I have a firmly held belief that anything you have with coffee in the morning counts as breakfast. Sure, it’s a totally self-serving and arbitrary tough rule, but I stand by it. So I made myself a cup of coffee, poured it into one of my favorite mugs (a 40th birthday gift), and had myself a delicious little breakfast. I mean, look at that. Who could resist? Pulse the flour, granulated sugar, vinegar, and salt in a food processor until combined. Add the butter and pulse until the mixture looks like coarse meal with pea-size pieces of butter. Add the egg replacer and water to the food processor and pulse until a dough just starts to form. (Alternatively, mix first 4 ingredients together in a large bowl until well incorporated. Cut butter in using a pastry cutter until mixture is coarse. Add egg replacer and water and mix until a dough forms.) Turn out onto a piece of plastic wrap; shape into a disk, wrap tightly and refrigerate until firm, at least 1 hour. Whisk the cream cheese, egg replacer, 2 tablespoons granulated sugar, and nutmeg in a small bowl. Set aside. Grease or lightly oil-mist a baking sheet. Roll out the dough into a 12-inch round on a floured surface, or between two pieces of floured parchment paper, with a floured rolling pin. Transfer the dough to the greased cookie sheet. Spread half of the cream cheese mixture over the dough, leaving a 2-inch border. Top with the pie filling. Fold the edge of the dough over the filling. Drizzle the remaining cream cheese mixture over the pie filling; refrigerate 30 minutes. While assembled galette chills, preheat oven to 425F. Place a pizza stone, baking stone, or inverted baking sheet on the center rack while preheating. Brush the galette’s crust with nondairy milk and sprinkle with coarse sugar (I used lime-infused cane sugar). Put the baking sheet with the galette directly on the stone or baking sheet in the oven. Bake until the crust is golden, 20 to 25 minutes. Let cool slightly before slicing. Dessert totally counts as breakfast! How is it different than a doughnut or danish, really? so pretty! 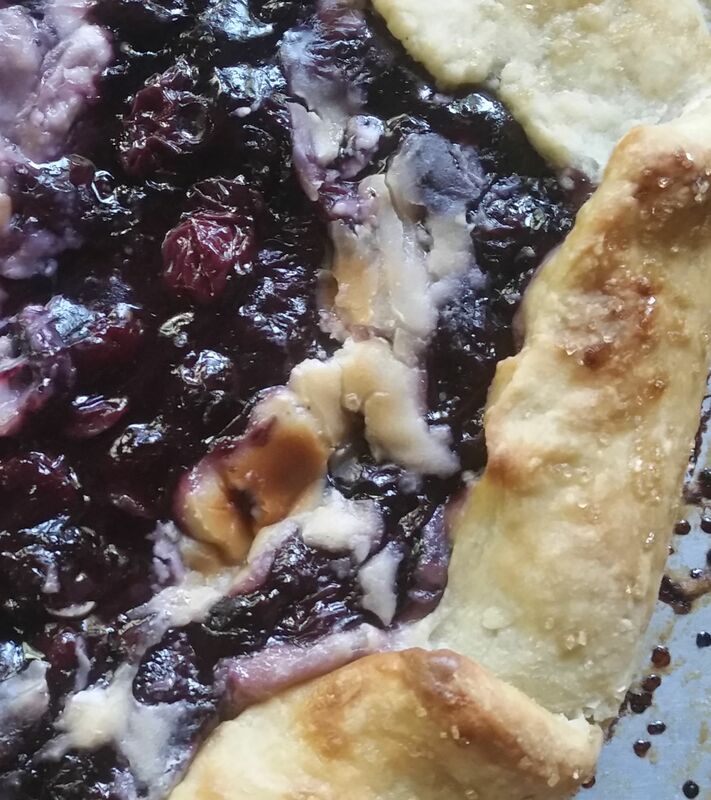 never thought of adding cream cheese to a galette, I live in a fruit tree agricultural region and all varieties of fruit galettes are popular around here. I bet cream cheese would be just as good with stone fruit – peaches, nectarines, plums, etc. Your comment has me curious how it’d be combined with apples or pears – maybe I’ll give that a try in a month or two! I definitely ate chocolate pudding for breakfast the other day…this recipe: http://blissfulbasil.com/2015/09/02/vegan-hazelnut-chocolate-nutella-pudding/ . Blueberries are the best! Oh my gosh. That looks incredible! 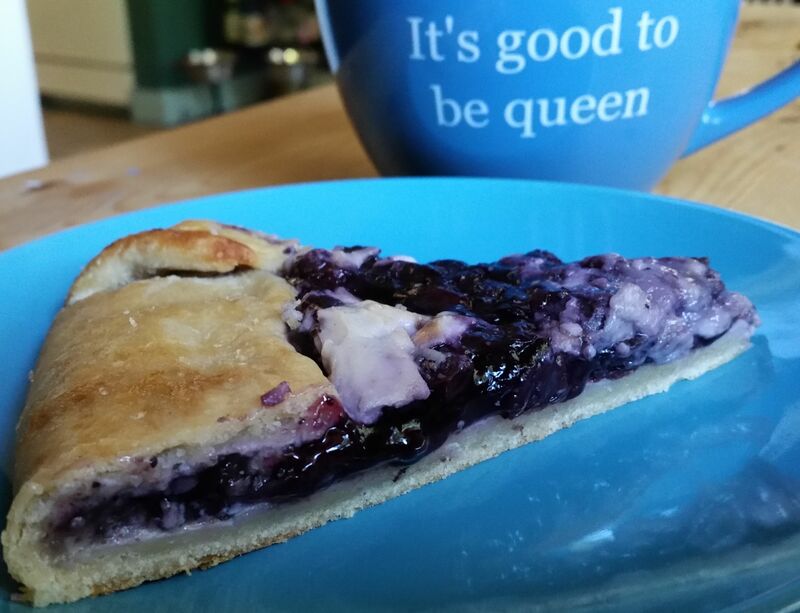 Pie for breakfast is an excellent idea, especially as it contains fruit!